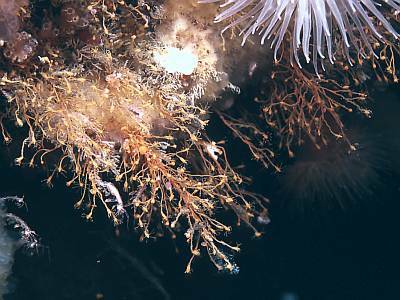 Description: A small athecate hydroid which is easy to recognise due to its bright orange coloration. The rounded polyps are borne singly at the top of thin tubular stems and typically bend over to one side. Height about 10mm, polyps about 2-3mm. Habitat: Usually occurs in shallow water in strong or very strong tidal streams, attached to cobbles or bedrock. Often occurs with Tubularia indivisa and may climb the basal part of the Tubularia stems. Similar Species: The coloration of this species is enough to distinguish it from Eudendrium species, which are otherwise similar. Picton, B.E. & Morrow, C.C. (2016). Garveia nutans Wright, 1859. [In] Encyclopedia of Marine Life of Britain and Ireland.